For those who did not know....my dad had to have his right leg amputated below the knee in an emergency surgery May 16th. He had been fighting off infections from his latest ankle surgery last year and with different types of medications had (thought) been given a green light. Well so much for that. 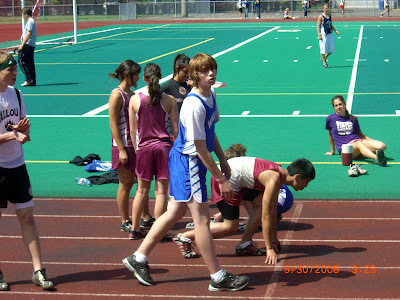 One day he was fine and by the next day his foot was huge, flaming red and hurt to move at all. He went into the emergency room on Thursday evening, was admitted & they preformed surgery the next day. The xrays done in at emergency showed all bone in his foot had just disintegrated and was starting to move up the leg. That was not the case six months ago. He only had to stay in the hospital a little over a week and is now home. He is in a wheelchair at this time and after some healing he will be moving to a prosthetic leg. Which in the end will be super. He will be able to go on walks, play golf and have a much better life than what he was putting up with. My mom was just sick that he wouldn't be able to golf anymore. He seems ok in the wheelchair but still has issues. For most people they have their other leg to support them to get up, down, it & out. He on the other hand has a left knee that is in need of a replacement and will not support any weight. That surgery will have to wait a bit now. He was planning on doing it in July or August but will now have to wait until they are fine with the amputation healing & walking around with the prostetlic. In the end, a bionic man!!!! Just say a few prayers for quick healing, strength and a positive spirit. I know this is the better choice for the future. He has more to do!!! 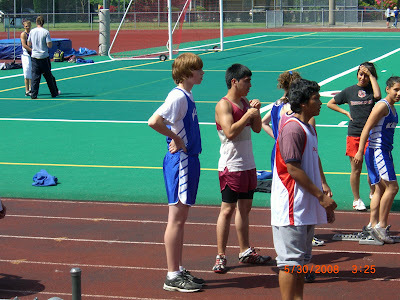 I am also including some pictures of Nic at his track meet. What a great guy!! My thoughts and prayers to your dad. My brother(age 47) lost his right leg in a construction accident.